No Soak Instant Pot Black Beans will change the way you look at cooking beans. No more thinking ahead so you can soak the beans overnight. Just place the beans in the pot and let the magic happen! Our friend Eric is the King of Black Beans. He’s famous for his beans. I asked him for the recipe years ago, and he couldn’t give it to me. It wasn’t one of those – it’s a secret – kind of things, but more of a I don’t really use a recipe thing. Eric’s beans taste a little different to me every time time I eat them. He was the Scoutmaster to our kids growing up. When he took the boys on a campout, breakfast the next morning was everything remaining in the cooler (eggs, chili, leftover hotdogs ) cooked in a dutch oven often covered in cheese. The boys loved it and thought he was the best cook ever! If you have never cooked beans without soaking, or if you’ve never cooked beans in your life (except out of a can), you are about to be pleasantly surprised. Traditionally, dry beans require soaking, but when using the Instant Pot, soaking is not necessary. Total game changer. Some people will say to soak your beans no matter (even when using the Instant Pot), for reasons that include everything from less gas (ummmmm, yes, that type of gas) to better appearance of the cooked beans (less splitting of the beans) but I don’t think it makes a difference. The definitely do not soak the beans advocates believe soaking the beans reduces the overall flavor of the cooked beans. They believe the best tasting beans are not soaked. I’m all for simplifying, so I love this recipe for No Soak Instant Pot Black Beans. No more planning the night before to make sure the beans are soaked. My recipe for No Soak Instant Pot Black Beans is short and sweet. A few simple ingredients: oil (to prevent foaming in the pot) meat, beans, onion, garlic and seasonings. Also, a few cups of broth for cooking the beans. I prefer broth to water. I use regular, not low sodium broth. I like my beans to be flavored with salt and I’ve found that regular broth works best for our family. I also add sea salt to the mixture. This recipe is kid friendly. Not too spicy, but interesting enough for adults to ask for a second bowl. No Soak Instant Pot Black Beans can be served as a soup or as a side. I love it served on top of rice. If you’re going to enjoy your black beans as a side ( perfect with Weeknight Turkey Enchiladas) you can do a few things to make the beans easier to serve (less soupy). After the beans are completely finished cooking, and all of the pressure is released, the top can come off of the pot and you can turn the setting to sauté. The heat level will come up in the pot and the beans will boil. Use this setting with the lid off will allow some of the liquid to cook off. If you have an immersion blender, you can place the blender in the pot and just pulse in a few areas for a second or two. I use my immersion blender at least once a week to thicken sauces without adding extra ingredients. Careful to not make the whole pot of beans mush! Using the immersion blender will smooth out a few beans, and when stirred, can thicken the mixture. If you’d like, you can also remove a cup or two of the beans and place them in a blender and whirl on low for a few seconds, then add back to the Instant Pot. Be very careful whenever mixing hot ingredients in a blender. The beans can also be served with condiments such as sour cream, grated cheese, chopped green onion and guac or chopped avocado. Pass the tortilla chips or warm flour tortillas and you’ve got a meal. Turn Instant Pot to sauté setting and pour oil into pot. Add sausage and cook until cooked and lightly browned. Remove sausage from pot and set aside until the beans are completely finished cooking. Turn pot off. Leave remaining oil in pot to prevent beans from foaming while cooking. Add the dry black beans, chopped onion, garlic, coriander, salt, pepper and stock. Place the seal in the lid, and place the lid on the pot. Turn the lid to the closed position and set the timer for 45 minutes. Let the beans cook, when the timer goes off let the pot sit until the pressure naturally releases, at least 30 minutes. The remaining pressure may be released manually. The "keep warm" setting may be used until you are ready to serve. A few minutes before serving, add the meat back to the pot and stir. -The recipe says to remove the meat from the pot before cooking the beans, and then add the meat back just before serving. I like to remove the meat so it won't turn the color of the beans. If you look closely, the photos show a batch of beans where I did not remove the meat first. If you forget to remove the meat, it is not a problem. -If you add additional vegetables to this recipe, it will produce more liquid, which is fine, but will water down the flavors a bit. Compensate by adding a bit more of any spices used. Also, you may drain off a bit of the liquid when finished or thicken by setting the pot to the sauté mode and letting some of the liquid cook off with the lid OFF after the beans are cooked and pressure is released. The beans may also be pulsed a bit using a blender (remove about a cup or two of the beans and liquid) or an immersion blender, then replace back into pot of beans. I’ve been giving the stink eye to a bag of black beans in my pantry for a week. ;0) Well I finally pulled them out this morning and have them soaking to cook tomorrow. Came here and found this recipe. I will surely have to try it with them. Looks so good,thanks for sharing. I love your description “the stink eye”! THat’s how I used to feel about dry beans. Give this a try, I think you’ll love this recipe! thanks for reading ABK! Oh I am so trying this recipe in my IP! Of course, I’ll have to change it up a bit and make a vegan version. Easy enough to do! Thanks ABK! You are the apple of my kitchen! Thanks Leanna. I think you’re going to love black beans in the IP! You’re welcome Grace! I hope you love this recipe as much as we do! What other dry beans could you cook this way? Kathy, I believe you can also cook red beans using this recipe. Red beans seem to be the most similar in size to the black beans called for in this recipe. If you try another variety of beans let us know! I tried this recipe and it came out delicious! Very easy! ???????? Thanks so much Rachel! Im making them again this week for Cinco de mayo! These were awesome!! We left the sausage out and after they were done ate them with avocado, sour cream, and hot sauce. I want to eat them every day this week yummmm! I loved this dish too! Especially over rice. Eating these every day may lead to health problems. hahaha. Looks delicious! Most charts say black beans cook in 20-25 minutes in the Instant Pot. Why the longer cooking time in this recipe? Thanks! I found that the beans needed the extra time to insure they were cooked all of the way. Since the beans are not soaked I think they need a bit of extra time cooking. Nothing worse than a bean that is undercooked! If you experiment successfully with less time, leave a comment and let us know. This was my first instant pot recipe. I omitted the sausage and replaced ground coriander with Badia Complete Seasoning. Served over rice, it was a hit with my kids, and with some habanero and avocado was good for more discerning palates. Thank you for sharing the recipe. Glad you had success with your first Instant Pot recipe!Avocado is the perfect topping for this dish. Thanks for sharing your adjustments. Make sure to try the IP Brown Rice recipe as well. Its perfect with the beans! I am glad the recipe worked so well with what I had on hand. Thank you for the tip on the brown rice recipe. I will check it out. I did not see any information on what pressure setting to use. My instapot has low and high pressure as well as multiple other presets. Sean, I have no idea? My Instant Pot only has the time manual control or the pre sets for items like meat, cake, etc. I would try the high setting for beans. Let us know! I love this recipe with Jasmine Rice, topped with the beans, with some Pico De Gallo on top. So yummy! Thank you for the recipe! Thank you Corinne! I will try it with Jasmine rice soon. It sounds delicious! We cooked our beans for 40 minutes and the beans came out perfect. We added about 1 cup of chopped bacon as our meat and it was just the right amount of meat to this protein packed meal. Glad you loved this dish. I hadn’t thought of using bacon. Sounds great! Thanks so much! 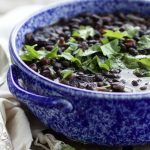 We absolutely love this recipe it is quick and easy and I agree, the best black beans I have eaten! 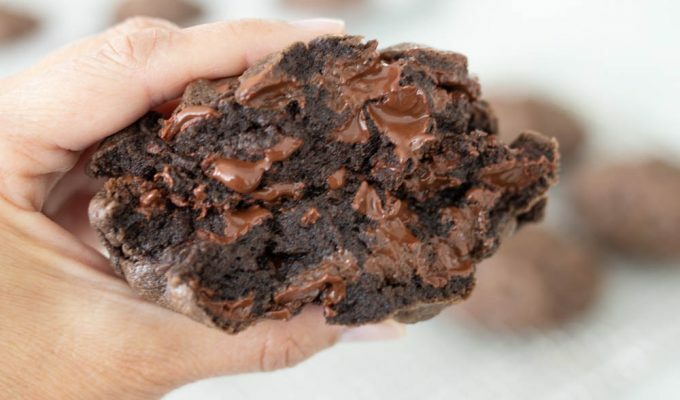 Can I make these ahead of time and if so how far in advance. Is there a freezer option? This dish will keep for about 3-4 days in the refrigerator. If you are preparing ahead, add the meat just before serving while heating up. Can I make these ahead of time, and if so, how far in advance? Is there a freezing option? What a great recipe and easy to follow. Amazing flavor, this was my first time using the by myself and the second time ever. That’s how easy it is. This recipe is amazing! So many ways to eat it. Our favorite is served over rice with some Pico De Gallo on top. Yummy. Thank you for sharing! I made these on High setting. The smell was heavenly! beans came out well cooked but tasteless. 2 quarts of liquid was about twice what I needed. The broth was pretty tasteless. I am a chef and can’t figure what I did “wrong.” I will take the beans out and make a corn and black bean salad tomorrow. Im sorry you didn’t love this dish. Have had lots of positive feedback here and on Instagram and through direct messages! It is one of our favorite meals to make using the IP! I have cooked black beans without meat and added the beans to Chile for those that don’t appreciate Texas Red. I have also coiked Chile with black beans and it comes out great at about 45 minutes. These were the best black beans. We froze some then wished we hadn’t froze any because we ate them so fast. We used bacon and left it in the whole time. Sooooo good. I bet they were delicious with bacon! Thanks for your thoughtful comment! We love this recipe as well. i love the idea of bacon, can you add it raw or do you have to pre-cook before adding? I think this recipe would take great with bacon. (What doesn’t?!). To add bacon to this recipe, cut bacon into small pieces, turn your IP on sauté and stir till the bacon is cooked to your liking. Take out the bacon, and pour out any remaining drippings, but don’t wipe down the pot. The bacon drippings will add a nice flavor to the black beans. Remember to turn the IP off sauté mode and restart for the bean recipe. Cook the beans as directed on the recipe, then stir in the bacon before serving. YUM. Please let me know how those directions work for you. Made this, except no sausage or meat, small can of diced tomatoes and a little green chile. Used “Better than Bullion” Base instead of stock. Oddly, when the black beans were done, they had turned red. They taste fine. Been cooking black beans for a long time and never had that happen — this was the first time in an Instant Pot. Any ideas why they might turn red? Your recipe sounds delicious! I have no idea why your beans turned red though. That’s strange. I hope you enjoyed this recipe. Don’t you love cooking beans in the IP?! First time I made black beans in my new instant pot and first time I ever cooked beans without soaking them. They came out great but there was so much liquid left that I didn’t want to throw out, I added 2 cups of white basmati rice and cooked it on the rice setting. Now I have delicious and nutritious beans and rice! Looking forward to checking out your other recipes. What a great idea and so easy! I’m glad you liked this recipe. Keep me posted on your other IP adventures! This was a winner! Thank you so much for sharing! Probably will be something I cook often. My hubby has diabetes and black beans are such a super food, I feel like this is a win win, he loved it. Thanks Lenora! Glad it worked for both of you! This is one of our favorite recipes as well! Improvised a bit with this and left out the sausage since we didn’t have any and I just wanted to use up a bag of beans and half a diced onion on hand. Since I had less onion than called for, I upped the amount of garlic to compensate. After NR the pot, I threw in a couple of ounces of sun dried tomatoes and put the pot on sauté to rehydrate the tomatoes and boil off some of the liquid. We love cilantro here so I threw in a handful and stirred it in before immersion blending. Result is a very tasty and easy black bean soup! Thank you for sharing your black bean soup tips. I love how easy it is to go from hard beans to soup without taking all night and day! Yummy! Made them vegan. They came out perfect, were ridiculously easy and delicious. Thanks. Will try the recipe with other beans and see what happens. Awesome! I have a close friend who also cooks vegan and said she had great success with this recipe as well! Thanks for your feedback, and thanks for reading ABK. I made this today with a few alterations because I was looking for more of a soup, and it turned out amazing. I used 4 slices of bacon as my meat/oil. I added the onion and garlic along with two chopped carrots and two celery sticks and cooked the vegetables a bit. Then I deglazed with 1 qt chicken broth, added the beans, 1 qt water, and substituted fresh cilantro for the coriander. This turned out really great and will be one of my go-to’s! Thank you so much for sharing your modifications. I love this recipe, it has been one of our most popular IP recipes to date! These are delicious!! I veganized – so no meat, added bell peppers, jalapeño, cumin, and chili powder. Used veggie broth but I think the broth was too much?? Next time will add only 1 quart (vs 2). YUM!! Thank you for your vegan tips! I’m sure many other readers will enjoy your vegan adjustments for the super easy IP recipe. After cooking the sausage and removing it from the IP. I deglazed the instant pot with some chicken stock. I like getting all sausage goodness into my beans. The next time I will reduce the stock by two cups. I had a lot of liquid left. The beans tasted great. Thanks for the recipe. You’re welcome! Thank you for your tips and comments on how you cooked this recipe. I love cooking in the IP- what a time saver. Thanks for reading ABK. Hi, I used to always soak until the beans split, but reading about Lectins in beans, to make them healthier, it is FAR better to pressure cook hi temp than to soak. If gas is the issue, add asafoetida ‘spice’ to the oil when cooking the meat, the enzyme asafoetida (or hing in India) takes care of the black beans flatulence. Pressure cooked and with asafoetida, the beans will be far more digestible and healthier. Even if no meat, ‘fry’ the asafoetida til it smells like sweet garlic, like 2 minutes. This is a great recipe. Perfect proportions of spice. I used “Field Roast” brand veggie sausage. Wow. Brady. Thanks for the information! Love hearing the science behind recipes. I appreciate your feedback. Made this today…first time ever using an IP. 2q was entirely too much liquid. Will use 1 next time. Other than that, they were “melt in your mouth” delicious!